Let’s start with that yellow blob close to home. This is the southern Gulf of Mexico system we’ve been mentioning. Some of the global modeling has been calling for this storm to come up the Texas coast and drop 12 inches of rain on Houston next week, but we explained this morning why that is unlikely. More likely, the system will remain off the coast, and may bring the Houston region 2 to 4 inches of rainfall next week at most, probably spread out over a couple of days. (For what its worth, the GFS model that was bullish on lots of rain next week so predicts there is only about a 30 percent chance Houston will receive 4 or more inches of rain next week). While it is far too early to say anything definitive about this system, and we are certainly watching it, we are not overly troubled by it, and neither should you be. Rather, we are becoming slightly more confident that the fall season’s first cool front will reach Houston during the middle of next week. No guarantees—there never really are with the season’s first front making it through—but we think there’s a healthy chance of lows in the 60 later next week. This front would, in fact, likely keep that yellow tropical blob south of Houston. So, fingers crossed! 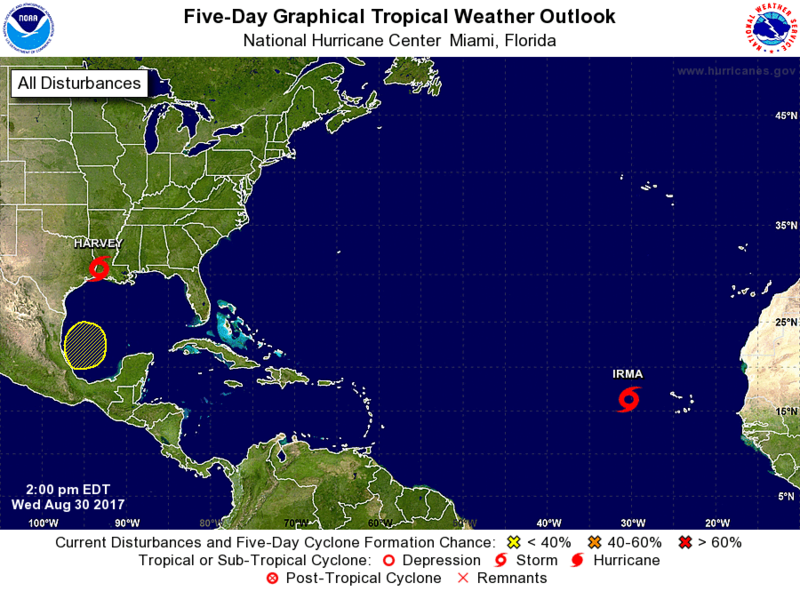 Secondly, there’s Tropical Storm Irma way out there on its way to becoming a hurricane. We’ve addressed Irma too. While this westward-moving storm probably doesn’t even make it into the Gulf of Mexico, even if it does come into the Gulf it seems unlikely to track toward Houston. Never say never with systems so far out, but our concern level with Irma, in regard to Texas, is low. Thanks! Your article on your main site was beautiful and moving. Please know that we greatly, greatly appreciate all you and your partners do. Isn’t this the main site? He means the article Eric wrote on the site where he is formally employed. Thank you Eric. All three of you guys have been a godsend to us in Houston during this event. I really appreciate your coverage. Thank you as always for your levelheaded, sane reporting. We live behind the Barker reservoir and dodged the bullet this time, but are somewhat concerned about the possibility of rain in the next week or so and the reservoir’s ability to handle it. What are your thoughts? Will a few inches of rain next week put us over the edge in a slow draining area? How accurate are the records from the 1890’s; are the temperature data comparable to today, that is, would a 75 temperature measured in 1890’s be measured as 75 with today’s instruments? The main concern I’ve seen about validity of data from the 19th and early 20th centuries isn’t with the quality of the equipment. Alcohol thermometers and mercury thermometers could be made and calibrated to the whole degree quite reproducibly back then, so the problem isn’t whether you’d get the same reading then as we get now. It’s the reliability of the person who did the reading: Did they actually check the thermometer and record the reading each hour? Or did they miss a reading and enter a guess the next hour, or even the next day? I recall a heat wave in Austin—maybe 1998?—when temperatures were being compared to record highs recorded in the 1920s. The records from the 1920s showed that the highs we were experiencing were unusual, but not unprecedented. Then someone noticed that “100”—not 99, not 102, but exactly 100—was often recorded as the daily high and that no other weather stations in the general area had had a heat wave quite like Austin’s. So what are the odds that so many days hit exactly 100? And how plausible is it that Austin was, say, 7 degrees warmer than normal while other towns in the general area were pretty close to normal? Modern equipment would be different in one important respect: you don’t have to be there to read and record the high and low when they happen. Today we can record temperature continuously. I’m not sure when thermometers that physically recorded the high and low were invented, but even those had to be reset daily, and it took a person to do that. So it wasn’t the instrument. It was the operator. There are no words for what you have done for this city. Thank you guys. Your hard work was greatly appreciated this past week. Thank you for your excellent coverage of Harvey. We have been out of town and hope to get back on Friday. Your reports were so much better than any of the other news outlets. Thank you to all three of you for keeping this site going and for all the updates. Thank you so much, Eric and Matt. Is there anything this community can do for you? Your service to keeping us calm during this storm at least deserves a medal, if not something much more tangible. How did your families fare? Do you need any assistance? How can we ensure that you “keep your lights on” and remain a huge asset to Houston and the surrounding area? —- Appreciate you more than you know. Thank you…like everyone else, we appreciate solid, substantial, accurate and truthful information. You have been our guide throughout these last few days…we appreciate you so much. Thank you, thank you, thank you! You guys preserved my sanity throughout the storm. When you had a blog on the Houston Chronicle, you helped me through Hurricane Ike. I’m grateful that I was able to find you again to help me through Harvey. Your information is studied, competent, and full, without hype. For both events, you were a touchstone of realistic sanity and kindness. Thank you. From Lexington, Ky: Can I send you some Kentucky bourbon? You kept me sane while I was concerned about son and family in Bellaire. They survived fine, while I lived on tranquilizers, prayers and your reports. You are heroes! Whooooa…playin’ with my mind…”first” cold front…get outta here…don’t you know we are imbedded in global warming?!! Holly Cow…where are my old man’s sweatshirts?! We are very fortunate to have Eric and Matt, and very grateful to both of you for your persistence in keeping us informed. Do you believe in man made global warming? I’m grateful for the service that you, Matt and Lee provide to all of Houston!! It truly is invaluable. Sure, it’s boring to read about 7 days of heat, humidity and mosquitoes, but when the crazy happens y’all are there to hold our hands. I’m glad y’all are all ok! 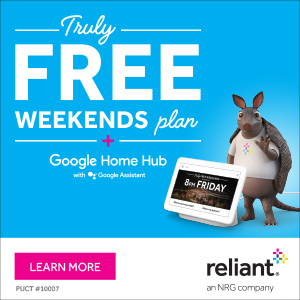 I just discovered this website during Harvey. I stopped looking at other sources except the NOAA gauges, which are quite interesting. Anyway, I had a question about Harvey and thought you might have an answer. 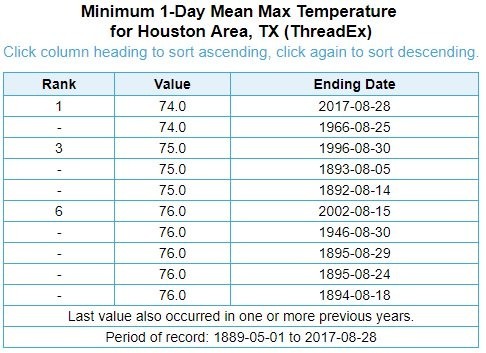 Harvey obviously had record rainfall in Houston. That is very clear. What I am wondering was if Harvey was had greater rainfall than is typical of a storm this size and intensity. In other words, to what degree was this a record storm and to what degree was the deluge a function of the storm’s stalling over Houston and then moving at the pace of a “slow walk” as you said. Do the big storms that never make landfall dump this much rain into the ocean or was Harvey somehow unique in its volume or concentration of precipitation?